We finished watching Daredevil the other night. If you haven’t seen it, do, it’s almost universally really bloody good. Also really bloody, the fight scenes are both elaborately staged and orders of magnitude burlier than everything we’ve seen from Marvel so far. This one, from episode 2, is a high point both in the series and modern fight choreography. But to my surprise, I find there are two characters that have stayed with me and that I’d really like to see do more next season. None of whom are on staff at Nelson and Murdock, Avocados at law. Marci Stahl, played by Amie Rutberg gives every appearance of being a fresh off the peg stereotype the first time we see her. She’s a Landman Zack attorney and gives Foggy tremendous pleasure in telling him that she essentially took his job. She’s power-suited, clearly very rich and absolutely cheerfully without remorse. She is, essentially, what Foggy spends most of the series bemoaning the fact he is not. Aside from the heels. Although personally, I think my man Mr Nelson could rock them. She tells him she doesn’t care, leaves for work and asks him to close the door when he goes. It’s such a lovely upending of what you expect that it short circuit the fact she’s being fairly mean to him and becomes charming. Marcie has her own life, of which Foggy is a tiny part and she’s not remotely interested in getting involved in his angst-ridden bromance with his partnet. She’s got stuff to do. Lawyer stuff. Expensive lawyer stuff. Which is why the moment she comes aboard works so well. Later, Foggy shows her the evidence they’ve gathered on Fisk and she buys it. Reluctantly, but she realizes that they’re backing a seriously bad guy and helps Foggy bring him down. The last time we see her in the season is a lovely, ambiguous moment. She watches her boss get arrested and, very slowly, smiles. We’re left to wonder whether she’s relieved at doing the right thing, or excited about the possibility of a promotion. After all, she can talk her way around an indictment. And if she can’t, she knows a Hell’s Kitchen boy who can. Marci is immense fun, cheerfully self centred and a neat contrast to everyone else on the show. I’d love to see her back and given more to do. I’d love to see her working with Jennifer Walters more, but hey, we can dream. Then there’s Father Lantom. He’s one of the characters the show plays close to its chest, never explicitly naming him on screen. In the comics, Lantom’s played a small but vital role for other characters but here he’s pretty solidly Matt’s parish priest. Matt may not want, or need, a parish priest but as he finds out, that’s not how this works. Lantom works for two reasons, the biggest of which is that he’s not an idiot. Lantom has a pretty good idea who Matt is from the first time he sees him but he’s clever enough to wait for the world’s most bloody knuckled lawyer to get around to wanting to talk to him. He’s patient in a way I’ve only ever known priests to be, and that patience is mixed with equal doses of compassion and brutal honesty. Whether it’s a latte or the confessional booth, Lantom knows how few people Matt tursts and knows how much he needs the priest to be one of them. He also knows how angry that makes Matt and that’s what elevates him from a good priest to a great one. Lantom: How are you holding up? Those two lines are a conversation an hour long; Matt talking about his guilt, Lantom talking about how little it matters and letting Matt know he has the space to do what he needs to do. All of it contained in two lines of dialogue. He’s grumpy, has no patience for people lying to themselves or him but is ready on a moment’s notice to help those in need. 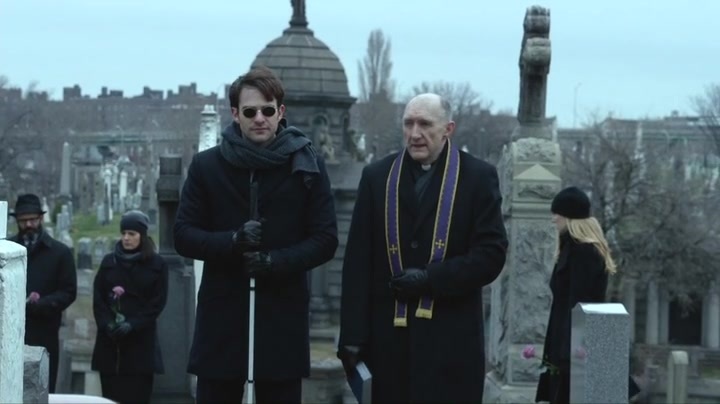 He’s not just a good priest, or a good man, he’s the exact father figure that Matt Murdock desperately needs. I’d love to see him back next season, if nothing else to see the epic clash of smartarses that would ensue when he and Foggy met.